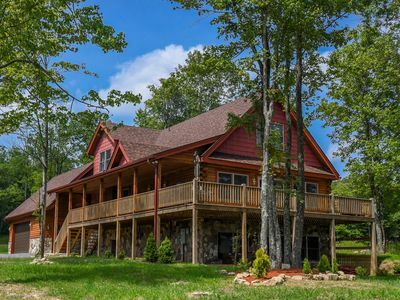 When it comes to scenic lake vistas, Infinite View is the ultimate Deep Creek retreat! 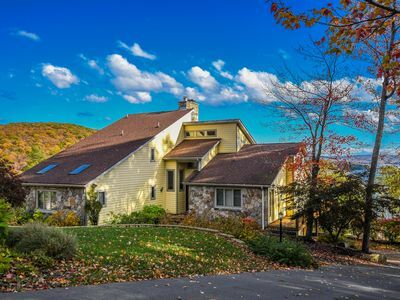 This well-appointed home boasts long range views from its hillside vantage point. 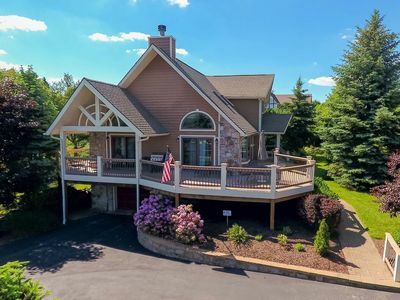 Natural light fills the spacious main level that is highlighted by tasteful décor, built-in bookcases, a wall of sliding doors that lead to the deck, warm wood accents and vaulted ceilings. Comfortable furnishings make the great room a popular spot to gather when you are chatting about your itinerary for the day or watching your favorite movie on TV. 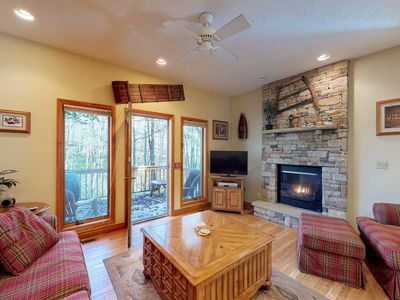 The massive stone fireplace is dual-sided, so its cozy glow can be enjoyed from multiple rooms. You will find everything you need in the well-equipped kitchen that features stainless steel appliances, polished granite counters and lots of cabinet space. The chef in your group can whip up delicious dishes to share at the dining table with amazing lake views as your backdrop. 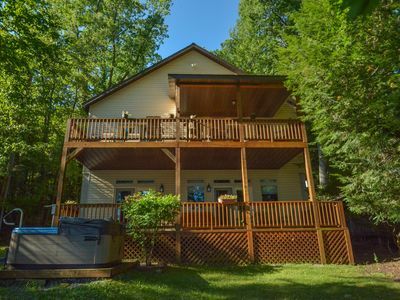 Access to the wrap-around deck makes it easy to grill out and dine al fresco on warm summer evenings. After dinner, you can gather under the stars by the fire pit to have s'mores for dessert! 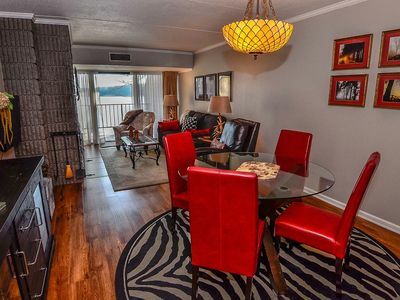 Furnished with your comfort in mind, the main level master suite has a king bed and TV. 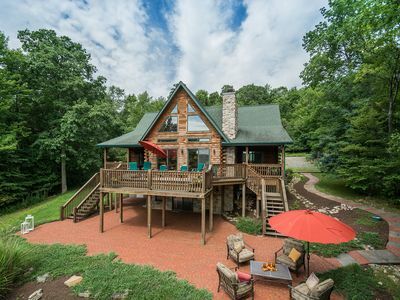 Doors leading to the deck are an added bonus when you want to unwind with the sounds of nature before falling asleep. 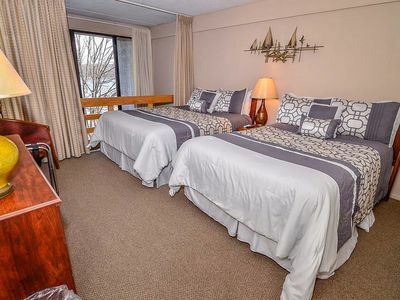 Also on the main level, a large bedroom with vaulted ceilings, skylights, a king bed, TV and soaking tub has an inviting ambiance that will leave you feeling entirely relaxed after a day spent hiking at Swallow Falls State Park or shopping in Oakland's historic downtown. The third main level bedroom has a bright and airy feel. It is outfitted with a TV and a shelf filled with lots of good books from which to choose. Head to the upper level to break out the board games in the loft sitting area that overlooks the great room. It is adjacent to a fantastic master suite with a king bed that is the perfect retreat when you need a little quiet time. Sip your morning coffee in the sitting area that has one of the best views in the house. 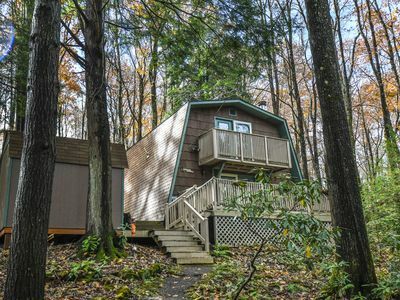 A full bath and a separate room with a jetted tub round out the amenities. The other upper level bedroom with a daybed is a great spot for the kids, and they will appreciate having their own space with a TV, cozy window seat and plenty of room to play! Everyone will love lounging in the lower level family room that has all of the essentials for a fun evening in. Watch the big game on TV, play a game of pool or challenge a friend to a foosball competition. 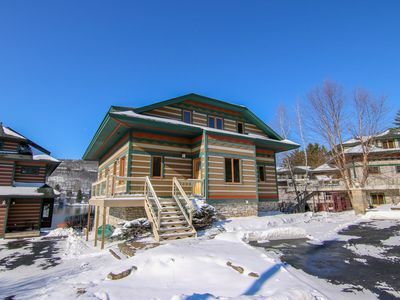 Before retiring for the evening in the lower level master bedroom with a queen bed and a murphy bed, step into the sauna where you can warm up after a day on the slopes. Infinite View's great outdoor space gives you every opportunity to savor the breathtaking lake views. 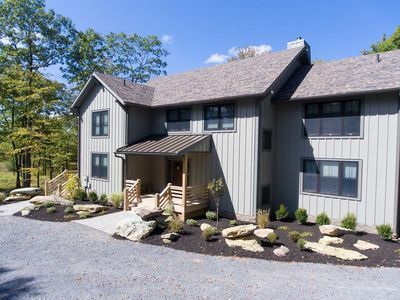 It is large enough for everyone to spread out as you soak up some sunshine and check out brightly colored fall foliage. The bubbling outdoor hot tub provides year-round relaxation. Within 0.5 miles, you can walk or drive to the community lake access where you can dock your boat, swim, fish or simply enjoy the scenery. 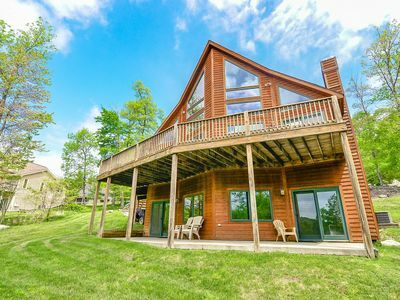 The central location puts you within an easy five to ten-minute drive from favorite Deep Creek Lake activities. Check out marinas, restaurants, mini golf, arcades, ziplines, kayak rentals, state parks and more as you explore the area. 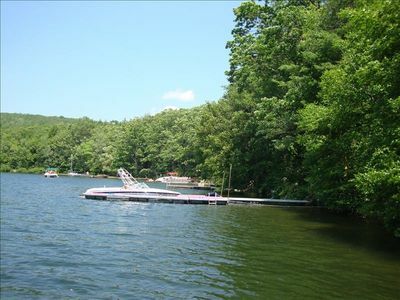 Wisp Resort is also close-by offering endless adventures throughout all four seasons. You can ski, golf, snow tube, mountain bike, ice skate and a whole lot more! 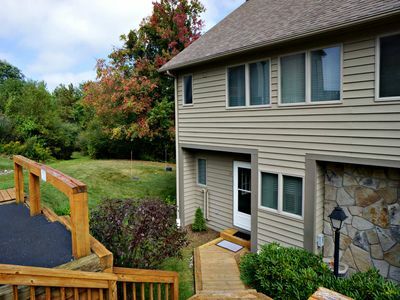 Discover a fun-filled getaway that will leave you longing to return again and again when you choose Infinite View for your Deep Creek vacation! 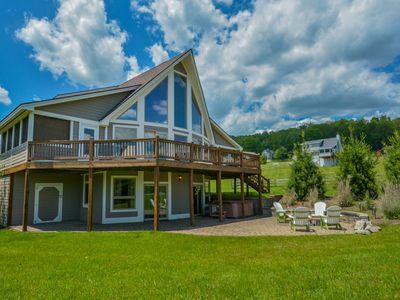 Amazing 4 Bedroom Luxury home with hot tub close to Wisp & area activities! 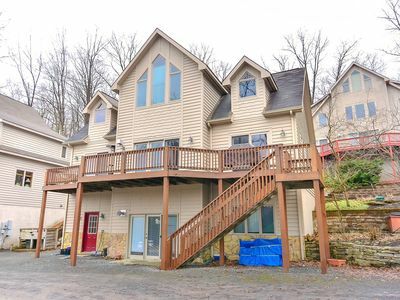 Appealing 3 bedroom townhome w/ hot tub offers stunning views! 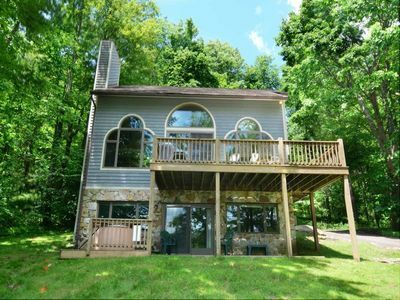 Spacious 4 Bedroom Home with Hot tub on Deep Creek lakefront! 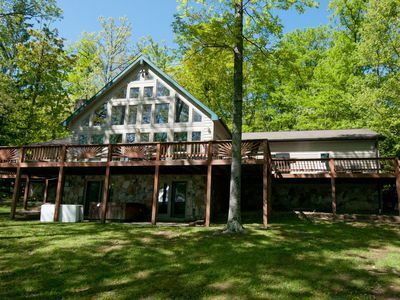 Stunning lake views, great outdoor space, close to Wisp! 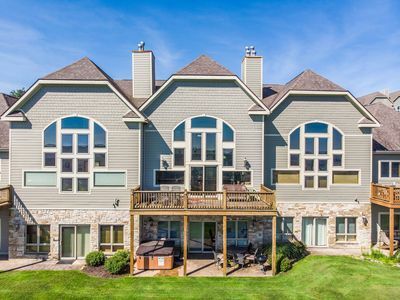 Luxury, lake front home with 5 master suites! 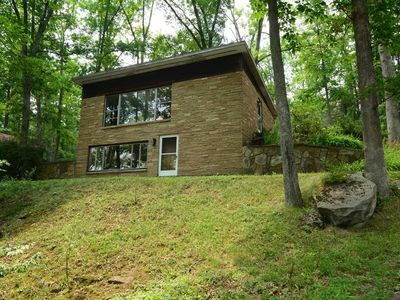 Less than 1 mile from Lodestone Golf Course!